Free Printable Barbie Crossword. 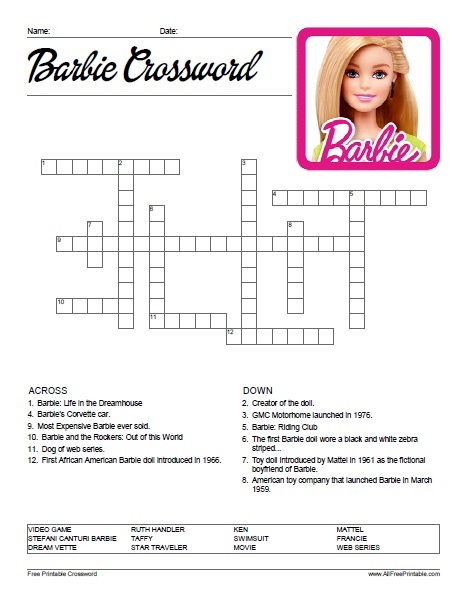 Free Printable Barbie Crossword puzzle from the Mattel doll Barbie. Have fun and test your knowledge of Barbie doll movies, series, toys. Girls can have fun with Barbie Crossword trying to find the correct answers to the clue. Great for a Barbie themed birthday, party, movie night, school activity or home activity. Solve this crossword that includes 12 Barbie related words like Dream Vette, Star Traveler, Francie, Movie, Barbie and the Rokers, Ruth Handler, Taffy, Ken, Swimsuit, Video game and Stefani Canturi Barbie. Includes 12 words with the answers on page 2. Barbie Crossword is ready to print in PDF format.